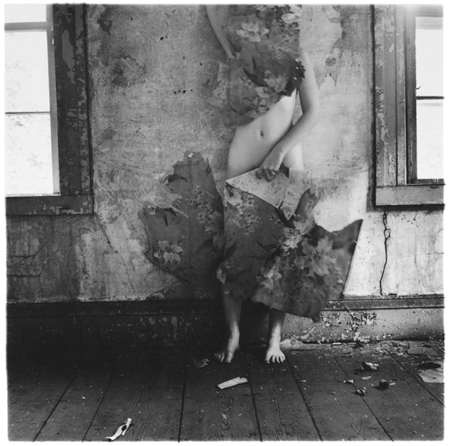 Though it has been nearly three decades now since Francesca Woodman (1958-1981) passed away, her photographic heritage continues to cast a spell on researchers, students of photography, and a general audience alike. Her youthful works (in retrospect made into an oeuvre) are subject to heady academic scrutiny, personal reflection, museum canonisation, and commodification (vintage prints from her student years change ownership for five-figure sums nowadays). Since Woodman’s artistic legacy was shaped in 1986 by a retrospective travelling exhibition, accompanied by a catalogue including one biographical and two theoretical essays (one formalist and a feminist reading of her work), she has been deemed precocious and prodigious. Her photographs have been called enigmatic, haunting, and poignant, amongst many other adjectives. Artistic influences have been pointed out: Surrealism, nineteenth-century spirit photography, minimalist sculpture, Duane Michals, the fashion photography of Deborah Turbeville. But her singular and peculiar oeuvre is also regarded as orphaned, as difficult to place “within the chronology of the institution of art photography”, in the words of David Levi Strauss. Also, her untimely death by suicide overshadows and complicates assessment and analysis, leaving open the question of how mature her artistic vision really was. For all the theoretical and historiographic difficulties that Woodman’s oeuvre provokes, a “naked” encounter with her photographs is a wonderful treasure to behold. For a little while it enables us to forget preconceptions about art, photography, and a whole range of –isms. 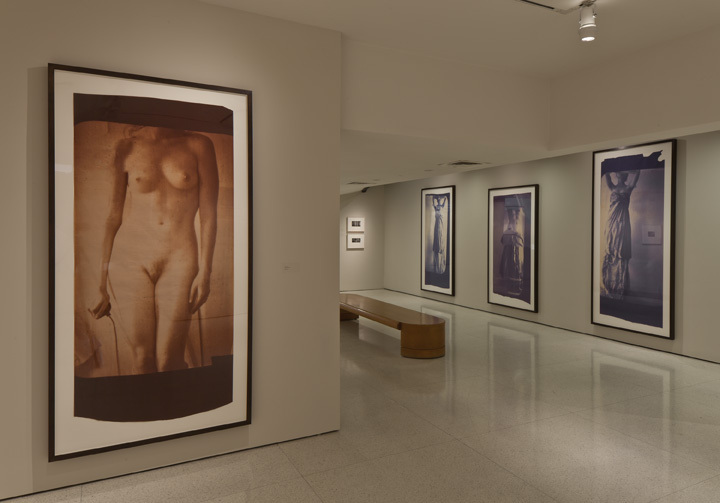 In late 2011 and early 2012, Corey Keller of the San Francisco Museum of Modern Art curated a retrospective exhibition on Francesca Woodman, the largest to date and the first in the United States in over twenty years, which was subsequently shown at the Mapplethorpe Gallery of the Guggenheim Museum in New York City. Roughly one-seventh of Woodman’s entire output was selected, leaving out her earliest photographs (1972-1975), which according to Keller didn’t yet constitute a resolved body of work. The exhibition is set up chronologically and divided geographically. The largest and already well-known body of work on show was primarily made in Providence during Woodman’s time as an art student at the Rhode Island School of Design (RISD), from 1975 until early 1979, and in Rome (1977-78) where she had spent a fruitful year on a scholarship. Many of these photographs were made in series (partly in response to school assignments) bearing generic titles like House (1975-77) or Space² (1976). 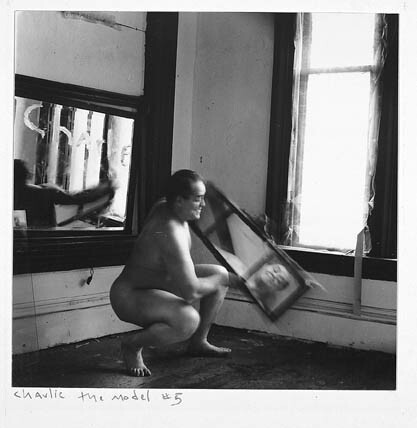 On a print of a series called Charlie the Model (1976)—in which Woodman and the art school model appear in the corner of a windowed room, playing with a roll of paper, a mirror, a glass bowl, and a glass plate—Woodman writes that she guesses that Charlie “knows a lot about being flattened to fit paper”. This line is almost emblematic for Woodman’s talent for flattening herself and her mostly architectural surroundings to fit photographic paper. Her short life was dedicated, with an urgency hard to find today, to performing in “dark rooms”, to the point of almost purely embodying photography. The magic that many of her pictures evoke brings back some of the enigma, curiousness, and freshness of photography from the era of William Henry Fox Talbot. Although a retrospective exhibition gives an opportunity to encounter Woodman’s small vintage prints (mounted and framed), compared to a well printed book the museum space is not the best of places to experience the intimate and emotionally intense work. Besides, it is not clear whether Woodman ever intended these small prints to be exhibited in a major museum at all, though she would likely have enjoyed the wide recognition that comes with it. What the show makes most interesting is that the heart of Woodman’s oeuvre gets embedded within her various other photographic projects: the (to date) lesser known and understudied video works (six of them with a running total of eleven minutes compiled out of an hour’s worth of material which Woodman had shot for a video class at the RISD); four digitally reconstructed prints from the 1978 thesis exhibition; two artist’s books (out of six – mostly second-hand early twentieth-century Italian books/cahiers in which Woodman pasted photographs and added notes or titles); and the final works of a much larger scale: soft cyan and sepia-toned blueprints (diazotypes) often compiled into sequences or montages, giving a glimpse of new directions Woodman was heading. 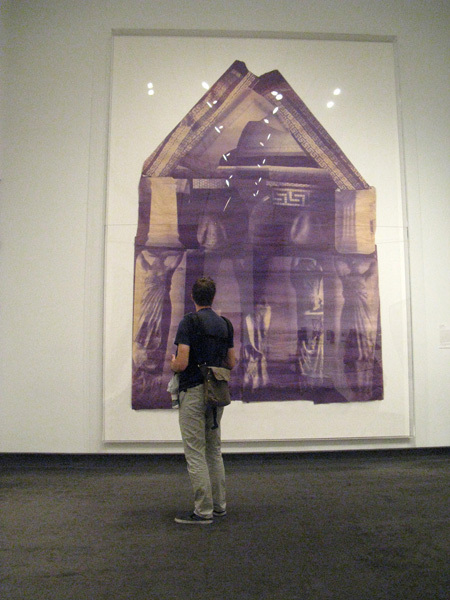 The large-scale Temple Project (1980) of over four meters tall, which didn’t fit in Guggenheim’s low gallery spaces, was fortunately on view as part of a small group show across the street at The Metropolitan Museum of Art. The retrospective and the essays in the catalogue reconsider the canonisation of Woodman’s work that has already been firmly underway since 1986, and opens up new lines of possible inquiry into one of the more intense and intriguing bodies of photographic work of the past forty years. This exhibition review on Francesca Woodman (Solomon R. Guggenheim Museum, New York City, March 16 – June 13, 2012) appeared in print, in a slightly different version, in Camera Austria 119 (2012), pp. 74-75.